The Great British Bake Off star Luis Troyano described a unique new curry recipe, which could rival one of the UK’s favourite curry dishes, as ‘delicious’. Forty years since the creation of the popular Balti curry in Birmingham, a restaurant in Bolton has developed a new version, dubbed ‘the Bolti’, in honour of its origin, with Lancashire Sauce as a key ingredient. Last night, (Thursday), Luis was among guests invited to The Royal Balti House, in Farnwood, Bolton, to sample the Bolti for the first time, as part of Bolton Food and Drink Festival. Afterwards he said: “I would definitely recommend the Bolti from Bolton. It’s got some special ingredients and people should hunt it out. You could taste the Lancashire Sauce and achari pickle, they added a whole new dimension. Balti curries are a staple on the menus of Indian restaurants throughout the UK and are enjoyed by thousands of people nationwide every week. The Balti is thought to have been first dished up in a Birmingham restaurant in 1977 (see BBC report below). The delicious dish is based on a traditional Balti recipe, but has been enhanced with achari pickle, along with one key ingredient – Lancashire Sauce made by family firm Entwistle’s of Ramsbottom. The new recipe takes the Bolti to “a whole different level” in terms of flavour, the restaurant claims. 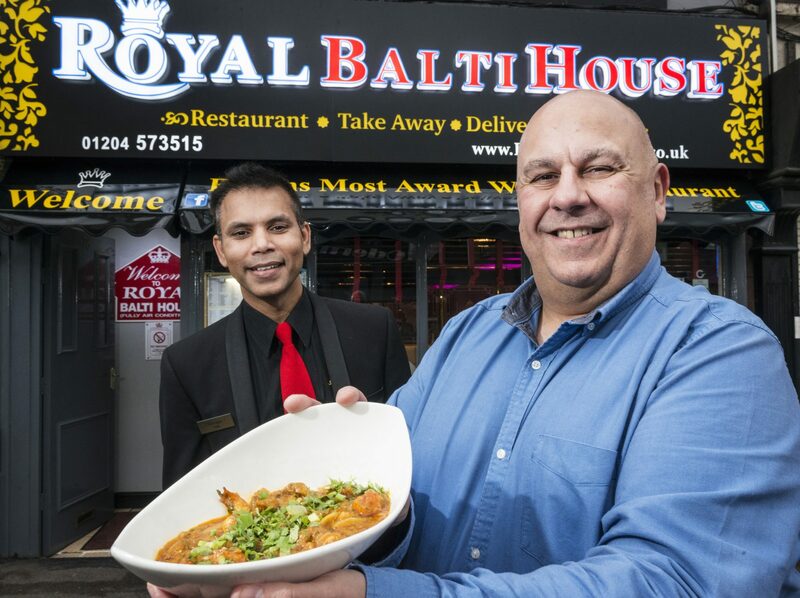 The Bolti has been developed by The Royal Balti House in Farnworth, which until recently was Greater Manchester’s No 1 Indian restaurant on Trip Advisor and has also won a series of awards. Manager Keith Meah (pictured with Luis) and chef Anwar Hossein say they have created the dish, described as ‘spicier, more tangy and aromatic’, in response to demand from regular customers who had tried everything on the menu and wanted something bigger and bolder. The Bolti has proved such a hit with locals that it is now set to be added to The Royal Balti’s regular menu. The restaurant has been asked to launch the dish at the Bolton Food and Drink Festival (BFDF), which takes place over the August Bank Holiday weekend (August 25 to 28). Mr Meah said: “We’re great fans of the Balti – we specialise in them, and that’s reflected in our name! We have many regulars who want to try something that’s not on the menu and so we create new dishes for them. This one is more tangy, spicier and more aromatic than the regular Balti and our customers love it. “To mark the 40th anniversary of the invention of the Balti in Birmingham, and the fact that we’re based in Bolton, we came up with the idea of calling our new dish the ‘Bolti’. The Balti is a dish steeped in history. Balti curries traditionally are cooked in a steel round-bottomed pan, using high temperatures for the last ten minutes to give them extra flavour. They are traditionally eaten straight from the dish, rather than from plates, with naan bread to scoop up the sauce. The word Balti means ‘bucket’ in Hindi, Urdu and Bengali and is thought to refer to the pan in which the curry is cooked. Birmingham was strongly associated with the Balti before it spread throughout the UK, with many Balti houses in the ‘Balti Triangle’, along and behind the main road to the south of the city centre, between Moseley and Sparkhill. According to the BBC, the Balti was first officially served in the UK by a restaurant called Adil’s in Stoney Lane, Sparkbook in 1977. Bolti sounds like a scrumptious recipe for success. I will most certainly have to pop by. Royal Balti House, see you very soon.